RD7100 offers the power of Radiodetection’s most advanced locating technologies, with each model optimized for a specific industry. Users benefit from the simplicity of having menu options and capabilities matched to their requirements. Our GPS and usage logging models are designed to facilitate the observance of best working practices amongst remote crews. RD7000TL features higher frequencies to locate high impedance cables amongst large bundled pairs and sonde frequencies for duct and conduit tracing. Higher frequencies can also be used to trace sheathed domestic cables without grounding connections. Cable sheath faults can be located to within 4” (10cm) using 8kHz Fault Find mode with a Radiodetection A-Frame. StrikeAlertTM in active and passive locating modes gives visual and audio warnings of shallow cables reducing the risk of accidents. 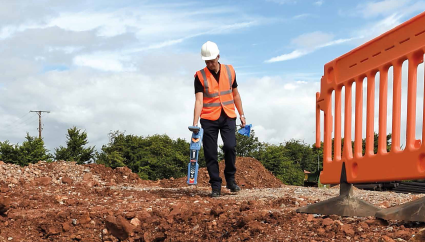 TruDepthTM ensures depth readings are only given when RD7100 is correctly oriented ensuring you can be confident in the result. ECERTTM allows you to verify and certify the calibration of your locator over the internet using RD Manager PC software package without returning the unit to a service center. Power FiltersTM uses the harmonic properties of mains networks to establish if a strong power signal comes from one source of multiple cables. The RD7100 is backed by an industry leading 3 year warranty on registration. Our global sales and service network delivers comprehensive technical support and training tailored to your needs.